Convergence and transformation in the physical, biological and digital spheres of society are the effects of the Fourth Industrial Revolution (4 IR), an era first recognised at the Davos Summit of 2016. The 4 IR reflects a perception that change that happens in all spheres simultaneously has far greater potential to disrupt the status quo. More powerful computing and new technologies will exponentially accelerate the effect, bringing rapid and continuous change. It is worth considering for a moment the accelerated change in technology. Back in 1965, Gordon Moore, the director of R&D at Fairchild Semiconductor, was asked by the American trade journal Electronics Magazine for his view on the future for semiconductors. Moore’s data over a 12-month period had revealed a doubling in processing speeds while the size and cost of the microprocessors had halved – an effect that became known as Moore’s Law. Although the time horizon for the law is now 18 months, this pace of improvement in technology capability and power has persisted for more than 50 years. In Gen Re’s acclaimed video research project the Incredible Curious Global Adventure, Curt Carlson, the president and CEO of SRI International – the company that developed Siri, the natural language avatar – cautioned that we must look at Moore’s Law in multiple dimensions to find the wide spaces for future disruption and innovation. Disruption and innovation are affecting all businesses, particularly the ways in which they interact with customers, and it is inevitable this will also occur in life and health insurance. The aim of the insurance industry is to grow the market for its products and in so doing provide valuable protection for more people. Last year, global life insurance premiums as a percentage of GDP reached around 3.5%. While access to cover has typically been limited to individuals in formal employment who have bank accounts and access to such products through traditional channels, over the next few years the growth potential for life insurance cover is considerable as insurance companies expand their reach. Technology may make this possible by enabling easier access to life insurance products for many more uninsured and underinsured individuals. The insurance market penetration of this technology is governed by multiple factors, including culture and the regulatory environment, so the pace and state of change differs by geographical location. Some insurers already collaborate with technology startups, acting as distributors or proposition facilitators. By utilising digital data and chatbots, these insurers have extended their propositions to “on demand” covers and to service and solution-driven support. Sensors and digital sources have the capacity to generate and collect thousands of data points, biometric markers and lifestyle factors that can be processed using algorithms to turn digital ones and zeros into meaningful risk insights. The following end-to-end breakdown of the life insurance process highlights the potential impact digital technologies and real-time data could have, particularly when viewed through a customer-centric lens. Access has two dimensions. Firstly, “true access”: How do we make life insurance available to a wider number of people and induce them to buy it, and secondly, how do we make customers’ experiences as engaging and intuitive as possible. Life insurance plays a valuable role in helping families, businesses and society in general to deal with unexpected and life-changing or life-threatening events. Additionally, through the risk-pooling actions of insurance models, the financial burden of these events is spread more evenly across society. Traditional life insurance models have been built around the mantra that cover is “sold and not bought”, the belief being that no one wakes up and rushes to buy a policy. A consequence is that the timing of an life insurance purchase is likely to coincide with a customer’s “life events”, including house purchase, marriage, birth of children, start of education and funeral protection. The sellers of insurance are typically qualified advisers, whether completely independent, directly employed by life insurers or other financial services institutions (e. g. banks, building societies, mortgage lenders, wealth and asset managers). The Internet and mobile phones can very easily change this dynamic by bringing life insurance into people’s homes and work places. This creates a challenge for the insurance industry in most countries. Furthermore, in developing nations that lack an established distribution infrastructure, this technology is primarily providing access to much needed basic health insurance products. Market analyst Venture Scanner counts 1,486 InsureTech companies worldwide. It is promising that several companies are now doing things differently. AFYA MED, for example, is a mobile-enabled insurer in Tanzania. Its fully digital offering, powered by mobile networks, allows customers to manage their cover and make claims with no face-to-face interaction. Clinical services are booked securely and paid for electronically. The result is a better user experience and lowered costs, while engagement via the networks boosts the numbers signing up and helps combat anti-selection. An important social purpose behind AFYA MED is its long-term goal to raise prosperity levels among the poorest segments of the population by providing not only successive generations with better healthcare but important preventative health information to customers and health workers. In developed markets, in addition to leveraging these learnings to access the poorer or informal sectors, it is also about making insurance easier to understand. In another example, Gen Re and Sherpa, a UK-based insurtech startup, have collaborated on a design that also starts from the insurance customer’s point of view. Sherpa demonstrates this focus in its commercial model, which is driven by membership fees – not commission earnings. Sherpa’s overall purpose is to reduce the complexity people associate with getting cover. By engaging the customer on a personal level and providing information, Sherpa ensures that people buy the most relevant policies for their needs. At Sherpa’s core is an algorithm that evaluates individuals’ needs and makes recommendations. Customers use the tool to tailor coverage and review needs annually. Sherpa does not distinguish between life and non-life insurance but recognizes that personal data is fundamental for identifying the relevant protection and making it possible to offer it when it is needed. The last part of the Sherpa proposition is the goal of helping its members navigate the complicated insurance buying process, ensuring they buy the most relevant policies to cover their needs. The above two examples demonstrate how insurers have made their products more accessible to existing and new clients and how they can educate and engage them in identifying their needs. The next step would be to make the application process more efficient to facilitate more sales. The future is all about data. Not only will entities that have access to data be more successful, but customers’ personal data will be a powerful driver in the development of future insurance propositions that enable them to live better lives. This is key to ensuring that our customers and potential customers are comfortable in sharing their personal data and information with us in the future, and to our being able to harness that data using our deep knowhow of medical and financial matters in order to ensure benefits that enable customers to live the lives they want. In an ideal scenario, our customers will no longer need to apply for cover, and we as insurers should be in a position to make relevant offers when they need them. Royal London, a large UK mutual life insurer, has partnered with a mortgage broker to develop a simple life insurance application. The design by Royal London’s data analytics team, again working with Gen Re, applies machine-learning techniques and big data analytics to mortgage application data, life insurance application data and external data sources. 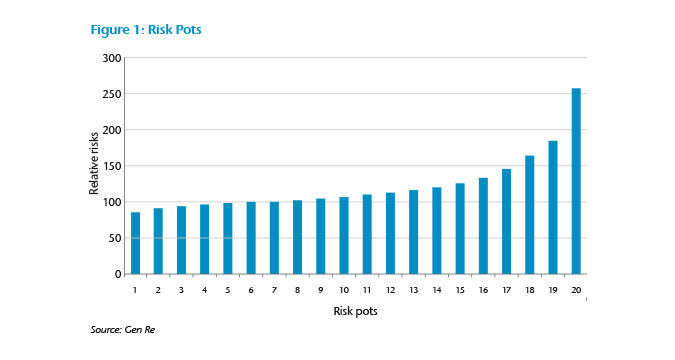 The result is a risk assessment model that splits the community into quintiles of increasing risk, known as “Risk Pots”, shown in Figure 1. In this model, a novel scoring engine replaces the friction inherent in a traditional underwriting approach, reducing the number of application questions dramatically. The model doesn’t do individual underwriting but instead seeks an equitable solution across each quintile and across the whole portfolio. The advantages include: an extremely quick process, no need for the applicant to supply additional information, a much less expensive process than traditional underwriting, and the ability to integrate it with a mortgage sales process to provide much-needed cover to mortgage applicants. Potential anti-selection is managed by adding a small number of focussed underwriting questions that did not materially change the positives set out above. The result is a model that can provide terms for 70% of all mortgage applicants for life insurance at the point of sale. In 2017, more than 115 million wearables were sold worldwide. Estimated sales numbers for 2022: 200 million wearables. A number of insurers are looking at the potential to utilize data from wearable technology. This includes mobiles and any other non-invasive device, for example, wrist bands, arm bands, sensors on clothing and any other technology that can capture physical activity, sleep patterns and other metabolic markers. A hypothesis is forming in the market that the data from wearables could be harnessed to develop an understanding of an individual’s health and lifestyle and to assess his or her insurability, much as telematics has done in motor insurance. A competing hypothesis is that wearables can become the cornerstone of future life insurance propositions. This premise requires two fundamental changes in behaviour: firstly, that insurers use personal data to enhance their customers’ wellbeing, and secondly, that customers will share their information on an ongoing basis because of the trust they have towards their insurer. These are two non-trivial changes that are necessary to change the face of life insurance going forward, but the possibilities are inviting. It also brings home the new ethos in data privacy: The individual owns his or her data and will share this data only with companies that provide value in return. In moving into this new paradigm, insurers are responding to their customers’ changing habits, a phenomenon that is changing the nature of the contract between them. Insurers are no longer merely saying, “I will be there when something bad happens in your life”. Instead, the insurers’ are adding to their obligation in the contract and saying, “I will help you manage your life so that we can try and prevent bad things from happening, but when they do, I will see to it that you are best placed to deal with what needs to be done”. Another way of describing this change in paradigm is moving both the insurer and the customer from a “What if” to a “So, how?” mind set. Thus, the customer, with the insurer’s input, will be asking, “So, how will I be able to deal with this debilitating disease?”, or “So, how can I improve my cardiovascular health?” This alternative paradigm and that of “what needs to be done” are emerging themes in the Incredible Curious Global Adventure video project. Life insurers then become life enablers, to the benefit of their customers, their customers’ families, employers, society and themselves. In the insurance industry, attention is focused on underwriting because technology firms are challenging the norm. We are asking whether data from wearables could supplement or even replace the traditional underwriting journey. Or equally, why does underwriting only happen once at the beginning of the contract and never again? This was never easy or cheap to do in the past, but the rapid growth in the number of wearables and sensors, the range of metrics they record, and the ease of sharing the data has changed the dynamic. HealthyHealth, Torafugu Tech and PAI Health have used academic research to develop risk scores that measure the relative risk of the person to certain metabolic and cardiovascular diseases. All three companies understand the change to the new paradigm: Sharing such information must be of value to the customer as well as the insurer. They have all built user interfaces to communicate scores to users with information on how they can improve health outcomes for themselves. HealthyHealth uses smart devices to collect and analyse lifestyle data on exercise, nutrition and vital signs, and its algorithms translate this data into personalised health and lifestyle improvement plans that use cognitive methods to engage customers. PAI Health uses links with high grade wearables to measure the body’s response to the intensity and duration of physical activity by translating heart rate data into a single, accurate, meaningful metric that provides guidance and motivation to maintain optimal health. The approach uses the person’s own baseline score as a basis for all future measurements. Torafugu has identified links between activity levels and metabolic diseases, such as diabetes, and uses similar cognitive techniques to assist its customers to improve behaviour and outcomes. It will take time to replace the traditional underwriting approach purely by using wearables, but as the data emerges and is amalgamated with data from the existing process, this will help us to create richer and more relevant underwriting processes in the future. Apart from the life-enabling aspects set out above, technology can help policyholders when they need to submit a claim. Many insurance companies have developed apps that customers can download and use to notify claims, to submit supporting data, to track progress and receive decisions on claims. A few insurers are investigating the possibilities of providing support and guidance remotely, thereby prompting some of the new technology provider companies, which understand the customer-centric view required, to direct their clinical apps into the insurance space in collaboration with Gen Re. Monsenso is a mobile mental health solution for engagement, monitoring and active support based on self-assessment, data from phone sensors, and physical and social activity data. Its services help clinicians support the mental health of patients remotely. In clinical use, it provides insights to caregivers and physicians through aggregated data and provides patients with support, feedback and even cognitive behavioural therapy (CBT). The underlying philosophy is that mobile technology allows for real time support for patients. Once again, having established a baseline for a patient’s behaviour and activity, deviations from that norm can be monitored and identified, prompting appropriate and timely intervention and support. This process is a lot more powerful than the regular monthly or two monthly visits to the clinician. Thrive is another company with a similar approach in this area. Thrive is a confidential wellbeing app that helps build resilience, prevent and manage stress, anxiety and other common mental health conditions – and proven to accelerate recovery. Both of these approaches have also been shown to facilitate a better return-to-work experience. Digital approaches can also provide support to customers in rehabilitating musculoskeletal injuries. Some companies, including AIMO and TrackActive, are also using the power of visual digital technology to enhance the experience and to facilitate improvement. AIMO is a preventative health solution that links the power of a smartphone to analyse movement data in an automated movement analysis platform. AIMO uses visual digital technology, leveraged through a downloadable app, to identify limitations in the movement of the person and then to create exercises that address that limitation. A 3D depth camera uses movement data to identify and score complete movement patterns, data that is used to compute individualized analysis and recommendations, such as training, treatment and equipment. It aims to help insurers engage with customers and reduce health claims costs, and could be applied to musculoskeletal claims or to underwriting. TrackActive is an AI engagement platform that provides early, cost effective and scalable interventions for rehabilitation and prevention of musculoskeletal conditions and chronic disease. By directing users to the most appropriate and convenient method of managing their conditions, it aims to improve engagement and speed recovery by delivering and monitoring exercise and rehabilitation. TrackActive has developed a complementary service that uses downloadable videos to show the customer exactly how to go about the relevant exercise to ensure no further damage and improve chances of a fuller recovery. Lasting change will come from truly understanding our customers’ needs and designing processes to help them to deal with the issues they are facing. Emerging technologies, including voice recognition technologies, will enable insurance companies to “get the job done” easily and conveniently, whether the technologies provide underwriting information or notification of claims. But this innovation in life and health insurance can only happen through a collaboration between reinsurers, insurers and new tech businesses, where each party brings its insights and skills together for the ultimate benefit of the customer.